Click on icon above to join us on the corresponding social media site. The Suncoast, located in beautiful Summerlin, is just the place to relax in elegant luxury; just a few minutes from City National Arena. Every room offers breath-taking views of the Las Vegas Valley or the Spring Mountains. All rooms have been recently remodeled and offer a minimum of 550 square feet. Chances are, your favorite game is here with over 1,800 video poker & slot machines, and a wide variety of table games. Enjoy world class golf at one of many courses around the area. Take a dip in a spectacular free-style swimming pool. Enjoy live acts in the Showroom, see the latest film in the Century 16 movie theatre, or bowl a few frames during Cosmic Bowling. The Italian-themed Tuscany Suites & Casino has a great location less than 1 mile off The Strip on Flamingo Road. The resort is set on 27 acres of winding pathways with fountains and pools. Tuscany has 700 rooms, each with 650 square feet in a studio suite. Each suite offers includes a refrigerator, coffee maker and an oversized bathroom. 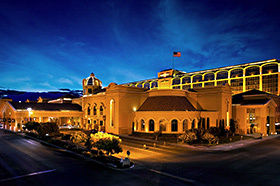 The Tuscany has an attached, full casino, with over 800 slot and poker machines, all the table games and a sports book. Dining includes Tuscany Gardens, Marilyn's Cafe and Caffe Bottega. Live entertainment can be seen at the Piazza Lounge. The ultimate in luxury accommodations. The Westin Kierland Resort & Spa is located in Northern Scottsdale, only a couple of miles from the Ice Den Arena. Most rooms have a balcony or terrace with views of the golf course or spectacular McDowell Mountain. Right across the street is the Kierland Commons with upscale shopping and restaurants. The resort features separate pools for adults and children, as well as a flowing river pool and waterslide. Experience Troon Golf at the 27 hole Kierland Golf Club. Agave, The Arizona Spa has 20 treatment rooms, saunas, massage therapy, skin treatments and salon services. The resort also has a complete fitness center with personal trainers, as well as hiking and biking trails. The Buttes, a Mountaintop Resort in Tempe, is a remarkably different, award-winning, 25 acre resort, sitting on a natural landmark overlooking the Phoenix skyline. The unique lobby is built right into the rocks. The luxurious rooms have a special western motif. The Buttes three restaurants are highlighted by the dramatic Top of the Rock Restaurant featuring fine southwestern cuisine. The adjacent Top of the Rock bar, with nightly music and dancing, is one of the nightlife hot-spots in the area. The Buttes has unmatched recreational facilities. It starts with a cascading waterfall from the lobby down to the two free-form pools with a water slide. The poolside bar and grill means you never have far to go for some cool refreshments. There are four secluded mountainside whirlpools to relax in while enjoying a spectacular view of the entire "Valley of the Sun". The Buttes also has four lighted tennis courts, two beach volleyball courts, and a health club complete with sauna and massages. The Plaza's prime location on Scottsdale Road puts you right in the middle of Scottsdale's great restaurants, night spots & shopping. The Scottsdale Plaza offers multiple room types to fit everyone's needs. The Bi-Level Suites have over 900 square feet of spacious luxury. The lofted bedroom has its own bathroom & television set as well as a private balcony. The spacious living room is a perfect gathering place for the whole team. It includes a wet bar, fire place, patio, & separate dining area. There is a fold-out sofa bed & a second full bathroom. The Sheraton Grand at Wild Horse Pass is unlike any other resort. It is conveniently located just south of Phoenix Sky Harbor Airport, just minutes away from Chandler Ice Den, and just a quick drive to AZ Ice Gilbert and the nightlife on Mill Avenue in Downtown Tempe. Teams staying at the Sheraton Grand at Wild Horse Pass will have priority for their games at the Chandler Ice Den, The Native-American decor perfectly compliments the beautiful land the resort sits on, and provides a sense of local heritage. The guest rooms provide an ample amount of space, with some rooms including their own personal, furnished balcony. The rooms also include spacious bathrooms with upgraded amenities and plush towels to make you feel right at home. You can enjoy rounds of golf at Whirlwind Golf Club, get pampered at Aji Spa, or take a ride on an 111-foot waterslide that is showcased at one of the four resort pools. The large pool area provides plenty of space to lay back and relax. For those bringing their family, the resort also offers horseback riding at the Koli Equestrian Center, tennis courts, a scenic boat ride to Rawhide on the river surrounding the resort, and a special kids-only Sheraton Adventure Club. Start your day off right with a delicious breakfast from the breakfast buffet, take a much deserved lunch break at Aji Café, and end your day with an exquisite dinner at Kai; the only AAA Five-Diamond/Forbes 5-Star restaurant in Arizona.